From March 23rd to the 26th we competed at the world’s first FRC Iowa Regional in Cedar Falls, IA. 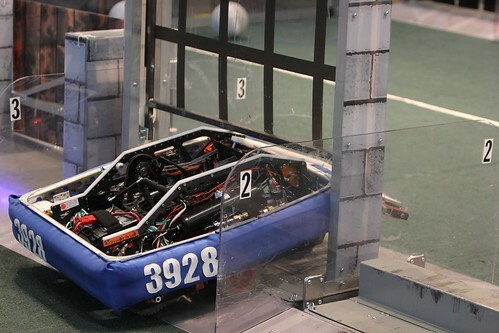 A few members of our team went to unload the robot and passed inspection on their first try. We played in a practice match and fixed up our robot to prepare for the quals matches. We played in match 6, 16, 31, 39, 52, 60, 68, 73, and 82. We experienced many mechanical issues with our drivetrain which placed us very low in the rankings. We ended up ranked 33rd by the end of the qualification matches. 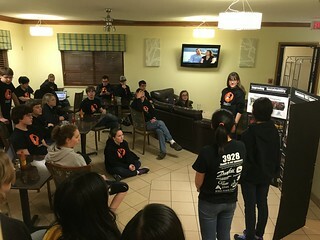 Despite this, however, we were picked by 167 – Children of the Corn and 3026 – Orange Crush. We made it to quarterfinals and won our first match. We were eliminated in the next two matches by the 2nd seed alliance. During this, our first competition this year, we l earned much about our robot and it’s weaknesses. We have been working on them for the Minnesota North Star Regional and will be well prepared to compete. We look forward to seeing all the teams there!